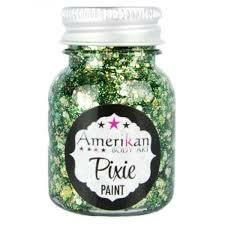 Pixie Paint is a blend of chunky and fine glitters suspended in an aloe glitter gel base. You can paint it on the face, body, and hair. Its perfect for Glitter Roots, cute Pixie-ish accents on the cheeks, and extreme coverage for dance clubs or festival body painting. Pixie Paint tends to stay put all day, with very little fallout, but can be easily washed off with water.